Something’s going on at the long-vacant quirky building on 15th Street North; anyone know what’s being done there? It’s been empty as long as I can remember, but I’ve always liked the colorful section above the doors, and the curvy feature of the building. The Pizza Hut/Wing Street is open in the Marketplace; we ate there two weeks ago, and the food was fine – basic Pizza Hut stuff, nothing special – but the service was…well, “bad” doesn’t describe it. It was actually bizarre; there were plenty of staff members on hand, but they just seemed to be totally unaware of what was going on. And it wasn’t just the standard “new eatery shake-down cruise” effect…it was just weird. Ate breakfast at Goode’s Q & Bayou Grill yesterday, and ordered the Haystack – and it was absolutely incredible. 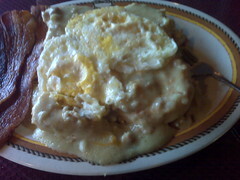 Hash browns, homemade biscuits, gravy, eggs, and a side of bacon. A picture doesn’t do it justice – but trust me. I’m not normally a fan of breakfast-style gravy, but this stuff was out of this world. 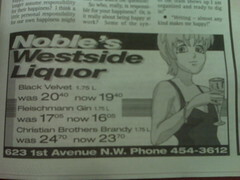 Using creepy anime-like drawings to sell booze – I don’t get it. Wow Dave, that breakfast looked great – I just finnished lunch, and if that plate was put in front of me, I’d dig right in! 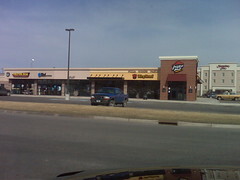 I ate at the Marketplace Pizza Hut on opening night (no, I wasn’t banging on the door to be the first in; I thought they’d been open for a few days…), and thought it was fine. Yes, they did get my order wrong, but in such a way that I would interpret as shake-down cruise stuff. And I’m hearing the siren song of that Goode’s breakfast. I think those colors were put on when it was a daycare. 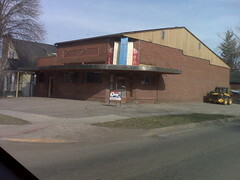 Yeah that building used to be a daycare I think maybe 5 years ago. Maybe less maybe more. Wow…. that plate of food looks like *yesterday’s* breakfast…. pre-digested, re-presented and plattered up with a coupla new slices of bacon. Seriously. I can’t even look at it. And the verification word for this post is UGF. Exactly! If you look at my comments on flickr for that building I have a brief history of it.